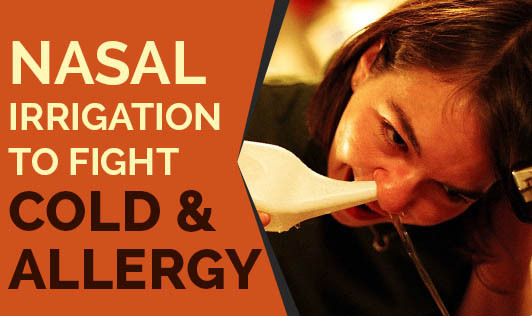 Nasal Irrigation (aka Jal Neti / Neti Kriya) is an ancient form of cleansing the nasal passages. It has been practiced for centuries by followers of yoga. The process involves passing saline lukewarm water through one nostril and dispensing it through the other nostril, using a container styled for this procedure. Benefits of this practice include removal of waste and excess mucus from the nasal passages and sinuses. People with clogged sinuses, infection, headache, nasal discharge, allergic rhinitis, common cold, etc., have found relief from symptoms after using this technique. However if this technique is practiced daily for a long term it might pose acute nasal problems. So check with a qualified yoga expert to guide you with the correct technique of Jal Neti and also the frequency of its use.